A troubled woman struggles to hold herself together during a family Thanksgiving reunion. In most director's hands, Krisha would likely resemble a talky filmed play, but Shults's film is a cinematic spectacle. His characters are constantly talking, but his story unravels in visual terms; what's said in this troubled home is never as important as how it's heard. 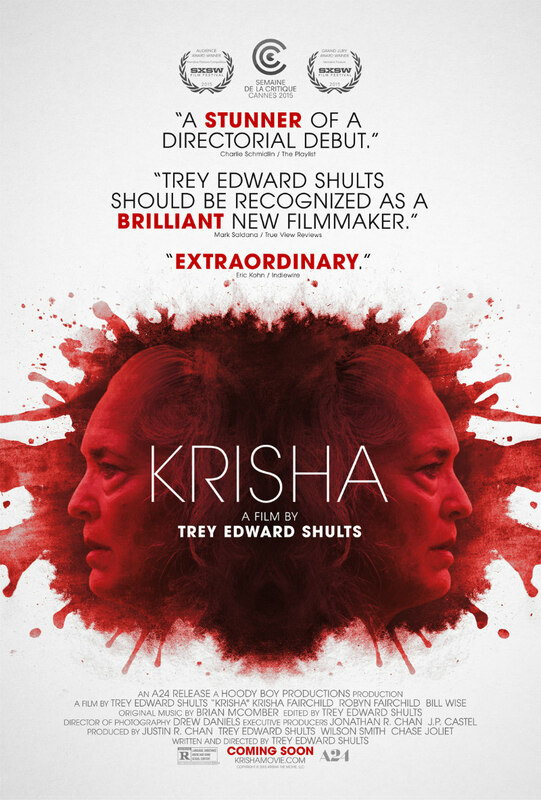 It's a family affair in Krisha, the highly impressive feature debut of writer-director Trey Edward Shults, both on and off screen. Set during one of those awful large family gatherings all sane people find excuses to avoid, Shults's film features a cast made up mostly of his own extended family. On the evidence of Krisha, which boasts arguably the ensemble performance of the year, they just might be America's most talented family. Shults's aunt, Krisha Fairchild, is a 64-year-old breakout star in the title role of a troubled woman who attends a Thanksgiving gathering at her sister's lavish suburban home (which is actually Shults's parents' house). We're introduced to Krisha through an extended tracking shot that follows her as she arrives at the house, the camera remaining behind her back until the climax of the scene, revealing a look of blind panic on her face as she realises she needs to behave like a 'normal' person for the next few days. Shults develops his lead character by offering us crumbs of information. It's clear Krisha has a troubled history (the tip of one of her fingers is missing, a detail never referred to in dialogue) and has burnt a few bridges where her family is concerned, but nobody seems willing to bring it up, save for her brother-in-law Doyle (Bill Wise), who scratches her damaged psyche with something close to a sadistic relish. Shults himself plays Trey, Krisha's estranged son, who clearly wants nothing more to do with his mother. This leads to one of the most uncomfortable scenes of 2016 when Krisha takes him aside for a misjudged 'catch-up' talk. As Trey refuses to make eye contact with his mother, we see Krisha's facade begin to crumble with the cold realisation that any chance of a late reconciliation is lost. There are two clear influences on Shults's visual style. With slow zooms, overlapping dialogue and scenes left to linger longer than we're used to, the ghost of Robert Altman haunts the Shults house. Krisha's slow breakdown recalls the wounded anti-heroines of That Cold Day in the Park and Images, but Shults also references Kubrick's The Shining, his wide-angled steadicam following his unhinged lead as she roams the halls of the house, muttering obscenities to herself. An explicit nod sees a family member manically slamming a ball against the floor. In most director's hands, Krisha would likely resemble a talky filmed play, but Shults's film is a cinematic spectacle. His characters are constantly talking, but his story unravels in visual terms; what's said in this troubled home is never as important as how it's heard. As a test of how together she really is, Krisha is entrusted with the cooking of the turkey, and Shults mines as much suspense from this culinary countdown as De Palma might from a slasher sequence. The ambiguity of Krisha's past keeps us guessing as to whether she's the film's victim or villain. The same goes for her family members. It's clear nobody really wants Krisha around, but is it out of cold-hearted cruelty or have they seen a side of her we've yet to experience? Is Krisha given the task of delivering an edible turkey because her family now believes in her, or because her potential failure might finally provide an excuse to permanently banish her, out of sight if not mind? In the film's dramatic and disturbing final act, we're offered some answers, but we're also asked the question of how we might deal with a Krisha in our own lives. Krisha is in cinemas December 9th.